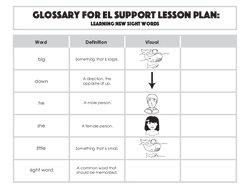 This lesson can be used as a pre-lesson for the Handy Sight WordsLesson plan. Big: Something that is large. Down: A direction, the opposite of up. Little: Something that is small. 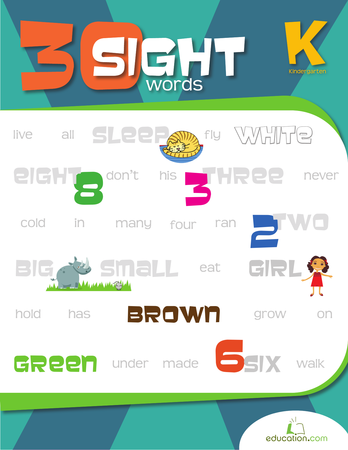 Sight word: A common word that should be memorized. Students will be able to read and recognise new sight words. Students will be able to identify grade-level sight words with more complex spelling patterns using visual and written supports. Display a familiar picture book to the class (big book if possible). Read a few pages aloud to the class while using a pointer to follow along as you read each word. Explain that when you read a book, many of the words are ones that you don't actually need to sound out. This is because they are a special kind of word, called sight words. Say, "A sight word is what we call a word that we should learn by sight. So that when we see it written down, we already know what it says!" 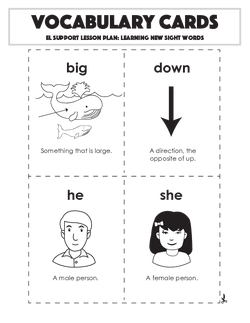 Display the vocabulary cards, beginning with the word "he". Ask students to look at the picture and repeat the word after you say it. 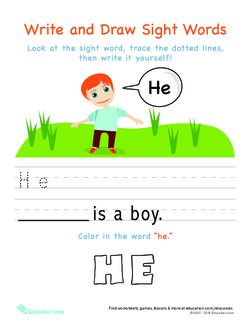 Show the students how to say the letters aloud, while tracing them on the vocabulary card, and then saying the whole word, "h--e--he." Repeat with the remaining focus words. Tell students that one reason we practise learning sight words by memory is to help us identify the word as soon as we see it written. Explain that after learning a new sight word, you will place it on the classroom word wall for students to reference. Model placing each sight word card on the word wall and demonstrating how you would find the word if needed (by first letter). Pass out the vocabulary cards to each student. Say each word aloud and have the students practise tracing the letters on each card while repeating the word. Have students practise looking at one card at a time, then turning it over and tracing the letters onto the rug or a table (without looking at the card). 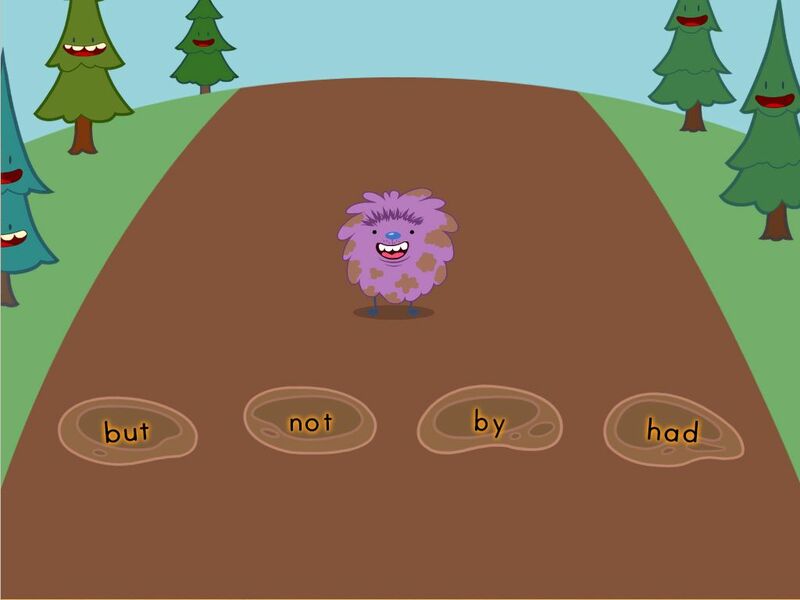 Introduce basic sentences, using the sight words, orally with the students. Have students only complete one of the worksheets during the independent work portion. 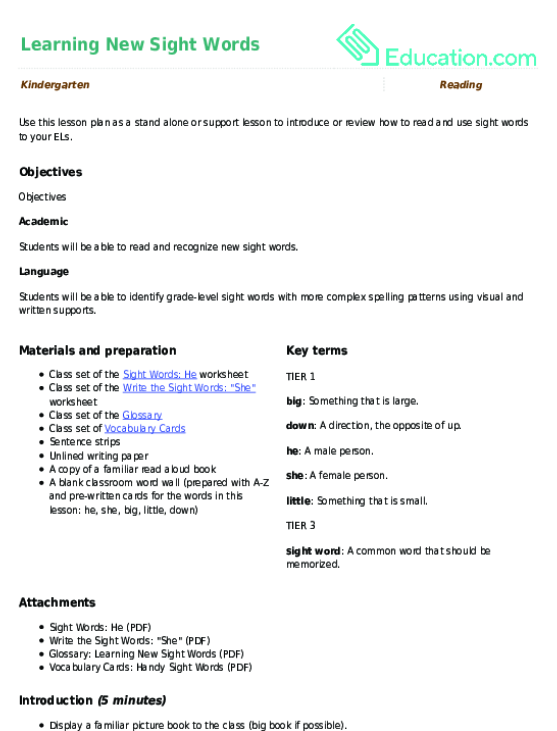 Work with students in a small group as they practise reading and writing sight words. Have advanced practise finding the highlighted sight words in levelled readers and/or picture books. 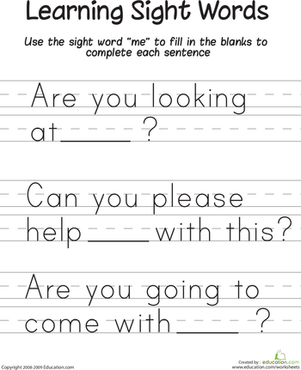 Display the sight word worksheets and explain that students will now get a chance to practise reading and writing the sight words he/she on their own. 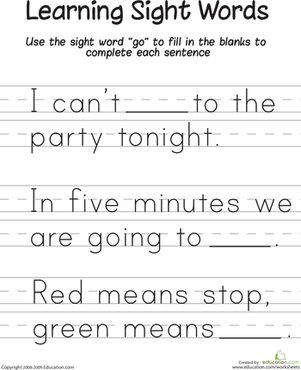 Pass out the worksheets to each student to complete independently. 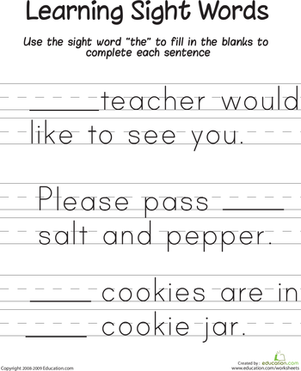 Ask students to identify the sight words on each worksheet and assess if they are able to use them correctly in the sentence. Close the class by saying, "The more sight words we can identify, the better able to read we will be. It's important to learn sight words so we can become better readers!"